On the twentieth anniversary of the shooting in 2017, survivors, family and community members attended a service at the former Heath High School, now a middle school, where a new memorial to the shooting victims was dedicated. Less than two months later, and less than 35 miles away, a sophomore shot sixteen people at Marshall County High School, killing two. Western Kentuckians were once again shaken and distraught, but they were perhaps not quite as shocked as they had been in 1997. Of course, no one expected a shooting at Marshall, and the victims and their families had no inkling of the horror that awaited them the morning of January 23, 2018. Yet the Marshall shooting now fit a dreadful, but all-too-familiar, pattern. Former Heath students, faculty and family members reached out to the neighboring Marshall County community to offer condolences and solidarity. This may have been the first time the Heath survivors had offered this type of support so close to home, but many had already done so numerous times in the wake of school shootings at Columbine, Virginia Tech, Northern Illinois, Sandy Hook, and other locations. 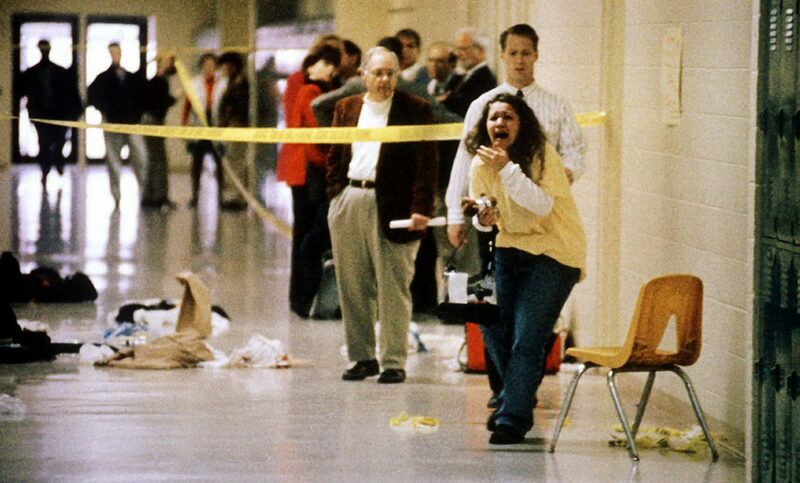 In 1997, the Heath shooting attracted national and international media attention. Helicopters and cars bearing the logos of faraway television stations and newspapers descended upon the town within hours, carrying reporters and photographers with little to no advance knowledge of the community or the events that had taken place there (one Louisville, Kentucky reporter recalled that a superior had told him to start driving the 215 miles west to Paducah, but had neglected to tell him why). Their outsider status led the out-of-town media to focus on different elements of the story than the local media, and it led to at least one grave error, as the Louisville Courier Journal printed a picture on its front page of a young man they inaccurately labeled as the shooter. This misidentified picture was picked up and distributed by the Associated Press, gracing newspapers nationwide. Of course, the violence at nearby Marshall County ensured that the Heath shooting would be discussed again, especially in Western Kentucky, and the tragic shooting just three weeks later at Marjory Stoneman Douglas High School in Parkland, Florida served to push school shootings and student protest to the center of the nation’s attention. At the same time, in the wake of larger shootings like the one at Parkland, smaller incidents like those at Heath and Marshall are rarely mentioned by name. It would be unreasonable, and perhaps unhelpful, for journalists to mention every school shooting every time they discuss school violence, but that does not change the concern of communities like Heath that their loved ones, their pain, their resilience and their lessons are being forgotten. To record the memories of those directly affected by the 1997 Heath High School shooting regarding the shooting itself, its aftermath, and the way the incident was portrayed in local and national media. To explore how these individuals have coped with the experience over the years and how they have responded to subsequent school shootings, particularly the 2018 school shooting in neighboring Marshall County, as well as to the media coverage and public debate that has emerged surrounding these events. This project will both preserve the memories of the Heath community and explore how these memories have shaped and been shaped by these individuals’ subsequent experiences. *See U.S. Library of Congress, Congressional Research Service, Public Mass Shootings in the United States: Selected Implications for Federal Public Health and Safety Policy, by Jerome P. Bjelopera et al. R43004, 2018. See also Christopher Ingraham, “What Makes a ‘Mass Shooting’ in America,” The Wall Street Journal, December 3, 2015. **Quoted in Joshua Roberts, “Public Concerns Prompt Heath Memorial Relocation,” The Paducah Sun (Paducah, KY), June 17, 2017.